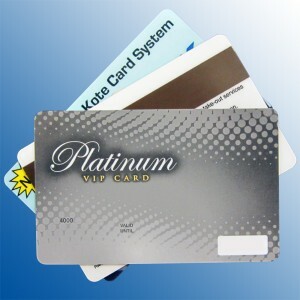 Cards of all types, including credit cards, identification cards, and loyalty cards are easily manufactured using D&K’s “Total Card Solution.” D&K works closely with other manufacturers in printing and die cutting fields to offer complete card production from start to finish. D&K’s card experts can provide suggestions for appropriate substrates, printing methods, lamination techniques, and cutting/punching processes that create flat and consistent cards. Substrates such as PVC, Styrene, and other synthetic papers can be laminated using traditional Polyester films or D&K’s revolutionary new PVC (vinyl) card films. Polyester cards should be laminated with “center cut” or Mapped & Matched PET film rolls, which partner together to provide a completely flat product. D&K’s PVC card films offer another roll laminating option designed for high speed production. Cards can be efficiently laminated using D&K’s Double Kote Card System.This system is specifically designed for fast and economical card manufacturing with increased production speeds and reduced labor costs. The Double Kote Card System offers the perfect alternative to platen press card manufacturing. Click here to contact a D&K card manufacturing expert for more information.